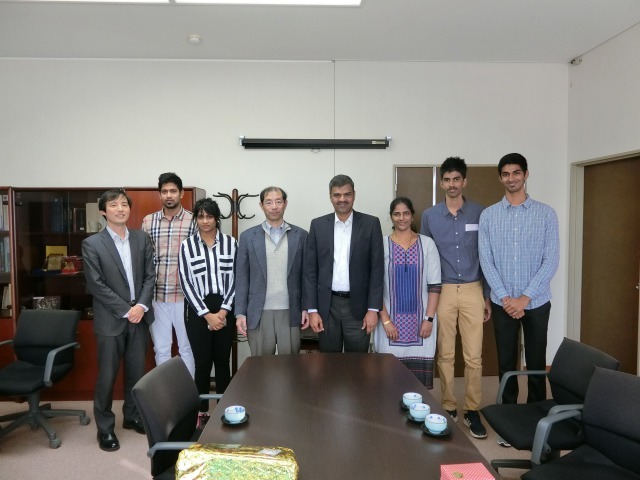 平成２９年１１月２７日（月）、チェンナイ工科大学（インド）から、P.Sriram学長が本学の飯塚キャンパスを訪問しました。 今後の協定締結へ向けての打ち合わせを行い、その後キャンパス内の見学をされました。本学からは、梶原 誠司学部長と田中 和明准教授が同席しました。 Mr.P.Sriram,Chairman of Chennai Institute of Technology (India) visited Kyutech on Nov 27th, 2017. They discussed about future student exchange program with Prof.Seiji Kajihara and Prof. Kazuaki Tanaka. They also had a campus tour to observe laboratories in Kyutech Iizuka campus.